In golf a true Grand Slam is accomplished by winning all four of the major tournaments, The Masters, U.S. Open, British Open, and the PGA Championship, in the same calendar year. To date, no player has ever won a true Grand Slam. There are, however, a number of golfers who have won all four of golf's major tournaments in their careers. That is known as a career Grand Slam. These are all the golfers who have won all four majors for career Grand Slams. Players are listed by the total number of majors they won, and I've put in parenthesis the age they were when they accomplished a career Grand Slam. Tiger Woods won all four Grand Slam tournaments consecutively in 2000 and 2001, but not in the same calendar year. Tiger tried to say it was the same as a true Grand Slam when he did it, but it​'s not. The four majors are played each year over a five month span. In 2000, Tiger won the U.S. Open, British Open, and the PGA Championship. There was then a gap of almost eight months to his 2001 win at The Masters. Even the press did not buy what Tiger tried to sell in 2001 and they called what he did a Tiger Slam. It was still a great achievement. I'm not including any amateur wins here. In the days of Bobby Jones, the U.S and British amateur tournaments were considered majors but I consider any amateur only tournament suspect because of the level of competition. 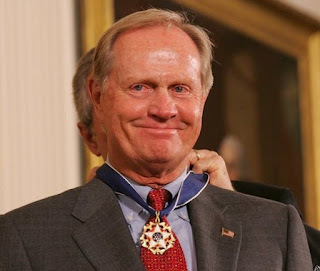 Jack Nicklaus won all four of golf's major tournaments multiple times in his career. Nicklaus won The Masters a record six times. He is tied for the most wins all-time at the PGA Championship with five, and also tied for the most U.S. Open wins in history with four. Jack Nicklaus also won the British Open three times, for 18 career majors. That is the most total wins in majors in golf history. It did not take Jack Nicklaus long to win a career Grand Slam. He won his first major at the U.S. Open in 1962 at age 22, and then won both The Masters and the PGA Championship in 1963. Jack completed a career Grand Slam in 1966 with his first British Open win. Like Jack Nicklaus, Tiger Woods has won all four of golf's major tournaments multiple times in his career. So far in his career, Tiger Woods has won both The Masters and the PGA Championship four times each. Tiger has also won both the U.S. Open and the British Open three times each, for 14 total major wins. That is the second most total wins in majors in golf history. 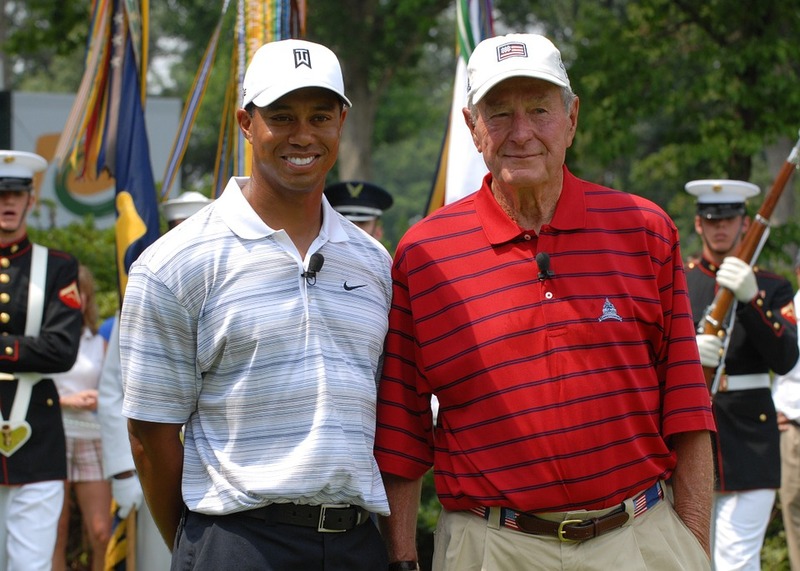 Also like Jack Nicklaus, it did not take Tiger Woods long to have a career Grand Slam. Tiger won his first Masters in 1997 at age 21, first PGA Championship in 1999, and then won both the U.S. Open and the British Open for the first time in 2000 for his career Grand Slam at age 24​. South African Gary Player won both The Masters and the British Open three times in his career. Player also won the PGA Championship twice, and the U.S. Open once for a career Grand Slam. Ben Hogan won the U.S. Open four times, The Masters and the PGA Championship twice each, and the British Open once for a career Grand Slam. Gary Player and Ben Hogan each won nine majors in their great careers. Gene Sarazen was the first golfer in history to win all four Grand Slam tournaments for a career Grand Slam. Sarazen won the PGA Championship three times, the U.S. Open twice, and The Masters and the British Open once each. Gene Sarazen completed his career Grand Slam by winning The Masters in 1935. Sarazen won both the U.S. Open and the PGA Championship in 1922. He won his only British Open in 1932. There are at least 12 golfers who who won three of the four majors in their careers including three active players in Phil Mickelson, Rory McIlroy and Jordan Spieth. The only major missing from Mickelson's career is the U.S. Open. Amazingly, Phil Mickelson has finished second at the U.S. Open a record six times. Rory McIlroy needs to win the Masters to complete a Grand Slam while Jordan Spieth is only missing a PGA Championship. Walter Hagen, who won 11 majors in his career, was past his prime when The Masters was established in 1934. I think there is little doubt that Hagen would have won a career Grand Slam if The Masters had been played during his prime. Jim Barnes was also past his prime when The Masters was created. Barnes won the other three majors, but never even played at Augusta. Barnes won four majors in his career. Lee Trevino and Tommy Armour also did not win The Masters in their careers. Trevino won six majors, while Armour won three. Tommy Armour was 39 when The Masters was created, so he had just a few chances to win the tournament. Sam Snead won seven majors in his career, but never won a U.S. Open. Byron Nelson and Raymond Floyd never won the British Open. Two of golf's immortals, Tom Watson and Arnold Palmer, never won the PGA Championship.